COPENHAGEN, Denmark, December 18, 2009 (ENS) – The Obama administration will commit $5 million towards international cooperation to reduce black carbon emissions in and around the Arctic. Nancy Sutley, who chairs the White House Council on Environmental Quality, announced the new commitment Thursday at the UN climate summit in Copenhagen. Black carbon, or soot, is composed of fine particles that are produced from the incomplete combustion of diesel fuel, wood, crop waste and other biomass, oil, refuse, and, in some cases, coal. 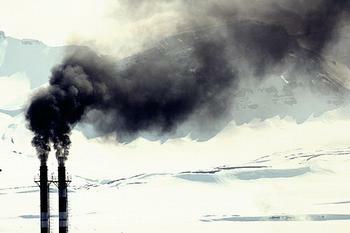 Black carbon pollution has well known and significant adverse impacts on human health. Science shows that these emissions play a significant role in warming the Arctic and accelerating ice melt. Sutley said the United States anticipates these funds will be matched by other nations to develop and implement mitigation efforts, which will help reduce Arctic warming while yielding direct public health and ecosystem benefits. The Arctic Council highlighted the role of “short-lived climate forcers, such as black carbon, methane, and tropospheric ozone on Arctic climate change. The United States views protection of the Arctic environment as an urgent priority. For this reason we strongly supported the Tromsø Declaration statements on short-lived climate forcers, and we immediately volunteered to co-chair, with Norway, the new Arctic Council task force. Today’s announcement further demonstrates the Administration’s resolve on this issue and is intended to jump-start international collaboration. Sutley said that she is encouraged that Norway and Sweden have already expressed interest in participating in the context of Arctic Council cooperation. Different financial instruments managed by Nordic Environment Finance Corporation could possibly contribute to and co-finance development and implementation of appropriate energy efficiency, clean technology, and transportation related projects. Strong evidence indicates that black carbon contributes to climate change by warming the atmosphere and by darkening the surface of snow and ice, speeding melting. Recent studies have suggested that black carbon is a significant contributor to the observed, amplified Arctic warming. Unlike long-lived greenhouse gases such as carbon dioxide, black carbon’s warming effects are short-lived, and therefore reductions in emissions will help mitigate Arctic warming in the near term. While U.S. air quality regulations for fine particles have largely controlled black carbon emissions from industrial and other stationary sources, recent regulations have targeted diesel engines, which are the dominant source of remaining black carbon in the United States. U.S. standards for fine particle emissions from new highway diesel vehicles are reducing black carbon emissions from these engines by 90 percent or more. Similar emissions standards have been adopted for new off-road diesel engines, including locomotives, and thousands of older diesel vehicles have been retrofitted with particle filters. The new initiative will include investments 1) to fill information gaps, 2) to identify barriers to implementation and develop approaches to overcome them, 3) to demonstrate and evaluate technological and non-technological mitigation options, and 4) where possible, to lay the groundwork to quantify the climate and, where possible, public health benefits of black carbon mitigation strategies. The investments are expected to focus on black carbon emitted by on-road and non-road diesel engines, including those used for port operations, older district heating and industrial facilities, and agricultural and forest fires that contribute to Arctic black carbon. The initiative will provide sufficient information and practical experience to describe the costs and benefits of tested interventions to reduce black carbon emissions affecting the Arctic. In launching the new initiative, Sutley further noted that the United States will work in the International Maritime Organization with other interested Parties to address particulate emissions from international shipping that contribute to Arctic warming.